Thinking about the structure of the digital humanities, it is always helpful if we can visualise it to provide some sort of map or overview. Here, I am exploring a way of representing the digital humanities through the common computer science technique of a software "stack". This is the idea that a set of software components provides the infrastructure for a given computer system or platform. In a similar way, here I illustrate the discipline of digital humanities with a pictorial representation of the layers of abstraction in the image given below. 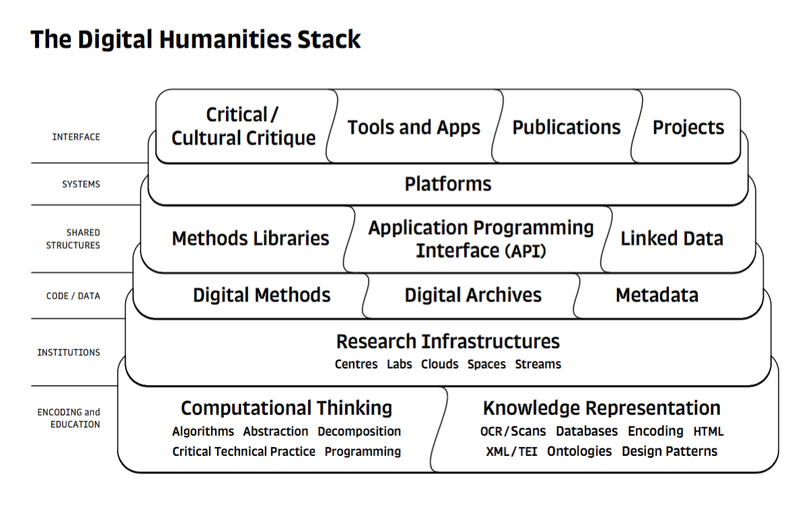 This gives the reader an idea of what I am calling the digital humanities stack. This type of diagram is common in computation and computer science to show how technologies are “stacked” on top of each other in growing levels of abstraction. Here, I use the method in a more illustrative and creative sense of showing the range of activities, practices, skills, technologies, and structures that could be said to make up the digital humanities as an ideal type. This is clearly a simplification, and is not meant to be prescriptive, rather it is aimed to be helpful for the newcomer to the digital humanities as it helps to understand how the varied elements that make up the digital humanities fit together. Whilst I can foresee criticisms about the make-up and ordering of this stack that I present here, nonetheless, I think it, more or less, provides a useful visual guide to how we can think about the various components of a digital humanities and contributes towards further understanding digital humanities. I deliberately decided to leave out the "content" elements in terms of the specificity, for example, of the different kinds of digital archive that we see across the digital humanities. I think that this is acceptable as the term digital archive does, I think, capture a wide range of digital databases and archival forms, although perhaps does not strongly enough signify the related material elements, for example in a "postdigital archive" that includes both digital and non-digital element. Relatedly, this diagram does not capture sufficiently, perhaps, something like the inclusion of a media archaeological collection in its materiality. 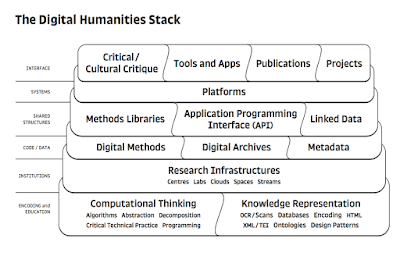 So this diagram can be read as the bottom levels indicating some of the fundamental elements of the digital humanities stack, such as computational thinking and knowledge representation, and then other elements that later build on these. Of course, diagrams simplify and even though I would have preferred for the critical and cultural critique to run through more of the layers, in the end it made for a more easily digestible visual representation if I didn’t over-complicate the diagram. The illustration here stretches the concept of a stack, in a strict computer science manner, as it includes institutional layers and non-computational elements, but as a heuristic for thinking about the digital humanities in its specificity, I think it can be helpful. As a version 1.0 of the digital humanities stack I look forward to reworkings of it and complication and re-articulations in the comments.